Update: After further analysis and discussion with NZ officials we believe that the current draft of the ACTA agreement would allow New Zealand to maintain its current damages scheme as represented by the (c) option in the agreement (additional punitive damages are decided by the judge). This means that New Zealand would not have to adopt a statutory damages regime to comply with ACTA. There's a new ACTA draft leak out, thanks to La Quardature. And does it contain a shocker when comparing the new and last leaked texts. In the Leaked January 2010 draft appearing above, New Zealand position on statutory damages (i.e. 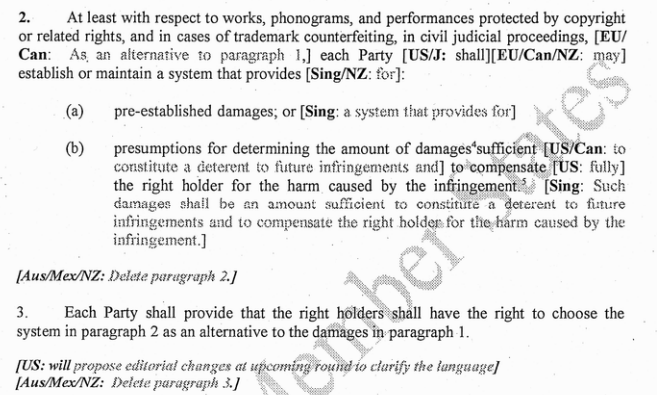 made up numbers like in the US where you face US$175,000 per infringement for each US$0.99 song) was fairly clear - we don't have such a damages system anywhere in our laws, and wouldn't accept one here. That is shown by notes proposing it's removal, and watering down the paragraph to "may" implement. Now looking at the post-Lucerne leaked text, any objection by New Zealand is gone. The "may" which would allow us to avoid implementing statutory damages is replaced with an unqualified "shall". Did we just concede statutory damages? Do claims by MFAT and MED that "no law changes are required" now stack up with the leaked text? Is the New Zealand position now all in favor of monetizing justice?